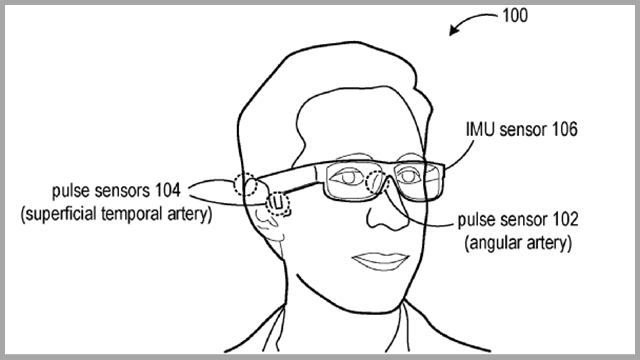 Microsoft filed a patent for an eyeglass monitor capable of tracking blood pressure called Glabella, that is designed to be easier to use and more accurate than a traditional inflatable cuff. Microsoft’s most recent eyeglass patent comes as rivals Apple, Amazon and Google and Samsung, have all filed numerous patents that offer clues about forthcoming potential groundbreaking technology. Google, in fact, previously filed a patent for eyeglasses that monitor heart rate. Microsoft software engineers Christian Holz and Edward Wang developed the Glabella prototype to continuously track blood pressure’s ups and downs. Microsoft’s patent application states that the device continuously measures and stores the user’s pulse waves at three different sites on the face and employs inertial sensors and a processing unit that compares the continuously recorded pulse waves – to obtain the user’s pulse transit time – the delay between the moments at which the blood ejected from the heart reaches the three sites. Pulse transit time functions as a proxy measurement to monitor the short-term behavior of the user’s systolic blood pressure, which Microsoft’s evaluation found shows a significant correlation with the patient’s blood pressure. Microsoft said the sensor has the potential to serve as a socially-acceptable capture device, one which would require no user input or behavior changes during regular activities and still collect data that would inform physicians and patients. Now we can wait and see whether these emerging technologies will make it to market and, if so, which tech vendor will be the first.